Well, the iPod Touch is here, and I've got to say, I'm disappointed. It feels like Apple is really gipping music lovers with this one, and that comes as a bit of a surprise. 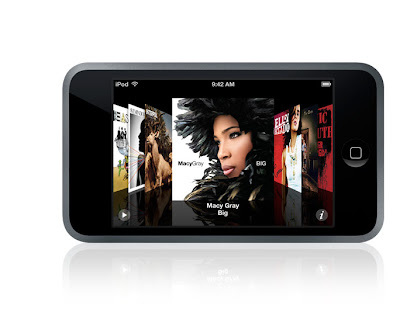 I really loved the minimalism and elegance of previous iPod generations, such as the 4 and 5G's, and the large capacity, since, afterall, the iPod was originally marketed as an MP3 portable music player. It seems as though Apple has traded in elegance and simplicity for flashy, snappy graphics and other stuff, I guess just to inflate the price and provide the illusion of "versatility". I don't really want to access the internet from my iPod...I want to listen to music; neither do I want to play around with contacts...I mainly think "music" when I think "iPod". Why on earth couldn't these things have integrated an 80 gig hard drive like the new classics, and dropped the accessories? I love the enhanced coverflow browsing, and the large widescreen display, and, of course, the touch-sensitive screen...but honestly, what am I going to do with an iPod that holds less than one-third of my library and a wifi connection?? Perhaps I could write this blog on my iPod. Fun.